Vuckovic ran from his goal line all the way to the referee near the half way line after the referee blew the full time whistle. Do you remember what happened the last time he did that after a certain grand final? Cornflakes had every right to give him a spray. And he realised he had to step up his game to be a Popa starting player. Didn't notice the Bobo bit, but he certainly whacked into Holosko nicely. Baccus, Santa, Sotirio. They all leaned into them. That's what's been missing in the last two years, the capacity to physically engage with Arnie's Smurfs and keeping the intensity up for 90 minutes plus. Hahaha, yes, and Vukovic, and Ninkovic. The Smurfs weren't happy at all, and Cornflakes wouldn't have a bar of it. 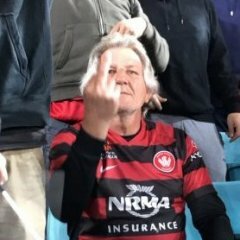 Nominated in the March A-League team of the Month along with Vedran, Santa and Jack Clisby plus Popa gets the coach of the month. Cornflakes is delivering the spine at the back we've needed since the best days of Topor and Meggsy. May not be as nimble nor as sure footed as Spira but in a back four that has been pretty average for almost all this season as he has improved and exerted more influence the quality of our defence has followed accordingly. Spira was not the same kind of player in terms of directing and dare I say adding muscle at the back that Meggsy, Topor and not Corny are. His ability to play a controlled possession based attacking style alongside his position as being a subordinate defender in how NTS led that group of back has him as a different player with a different role. To be fair to Spira this was a bit different when he was playing in the Socceroos, leading the likes of Sainsbury etc. Reading that made me sad and I feel for him. The Fox Football podcast did a special episode with Robbie, talking about losing his daughter and the work he's doing with the charity. It's a tough listen but gives some good insight into the character of the big unit. He also talks about how his new perspective helped him come back from the Popa treatment at the beginning of last season. I'll be interested to see if he gets the captains armband this season. Hopefully he can also provide assistance for others who get The Treatment. Hopefully he can also provide assistance for other decent players who get The Treatment. Met Robbie last Thursday at the JD Opening...had a chat with him about his charity work and his personal story (which I could relate to), my still-to-be-received 'Golden Cornthwaite', and offered him some South Australian goodies he probably misses (which Popa wouldn't allow anyways lol). Getting close to being the Wanderer Man Love Object to replace my geliebte Jerome Polenz...Captain Corny you deadset legend! last time he shaved his beard we conceded a goal in within seconds of the kick-off. I was on the fox sports fantasy site today checking my team, and according to their stats/figures/points values for the game, Cornthwaite is one of the worst defenders in the competition this year. What do they use to measure defenders? Until fantasy teams can measure leadership, organisation, positioning to stop passes being made, etc, then they really don’t mean ****. He also probably lost tonnes of points for the red. Minutes played, goals, assists, tackles, interceptions & clearances (I think, maybe they got rid of them) and clean sheets.